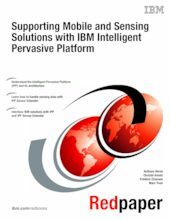 This IBM® Redpaper™ publication describes the IBM Intelligent Pervasive Platform and IBM Intelligent Pervasive Platform Sensor Extender. Intelligent Pervasive Platform (IPP) enables you to create mobile applications that seamlessly deliver customized information and services to mobile users, based on their profile and location data. IPP Sensor Extender (based on IPP) supports the collection and standardization of sensing device data from sensor platforms that consist of sensing devices, packaging devices, and gateways. After standardization, the sensing device data can be forwarded to other applications that report, analyze, and display this data. IPP Sensor Extender supports the Internet of Things and machine-to-machine communication. The paper is written for developers and others who are interested in using IPP and IPP Sensor Extender to create mobile and sensing applications.